Vitamin C (also known as ascorbic acid) is an important nutrient which must be obtained from the diet or by supplementation, as it cannot be synthesized by the human body. Major dietary sources of vitamin C are green vegetables and fruit. Vitamin C is one of the most labile dietary nutrients, being easily destroyed by cooking or food processing. Levels of vitamin C are reduced by smoking, drinking alcohol, as well as by certain drugs (e.g. anticoagulants, antidepressants, oral contraceptives). What does Pharma Nord Bio C do? Vitamin C is essential for normal tissue growth and repair, playing a vital role in collagen formation and strengthening capillary blood vessels. Vitamin C strengthens ligaments and tendons, prevents bruising and is required for wound healing. Pharma Nord Bio C Vitamin helps to maintain healthy gums and healthy immune function. Vitamin C is the primary water soluble antioxidant vitamin within the human body, protecting the aqueous cytoplasm within the main body of the cell from damage by free radicals. Pharma Nord Bio C Vitamin acts synergistically with the major lipid soluble antioxidant vitamin E, which protects cell membranes from free radical damage. The Recommended Daily Allowance (RDA, USA National Research Council) for vitamin C (for men and women) is 60mg/day (120mg/day for smokers). This RDA for vitamin C has long been challenged as inadequate, and the optimum intake for vitamin C has been conservatively estimated to be at least 200mg/day. Are there adverse effects from taking Pharma Nord Bio C Vitamin? The toxicity of vitamin C is extremely low, with doses up to 1000mg/day being completely safe. Very high intake of vitamin C (greater than 2000mg/day) may cause gastrointestinal disturbance in susceptible individuals, and may also interfere with the absorption of calcium and selenium (which should be supplemented). As vitamin C facilitates the absorption of iron from the diet, high intake of Pharma Nord Bio C Vitamin should not be taken by patients with iron overload syndromes (e.g. haematochromatosis, thalasaemia). High intake of vitamin C should not be taken by individuals with a susceptibility to kidney stone formation. Pharma-Nord Bio-C-Vitamin is produced under Danish pharmaceutical control. 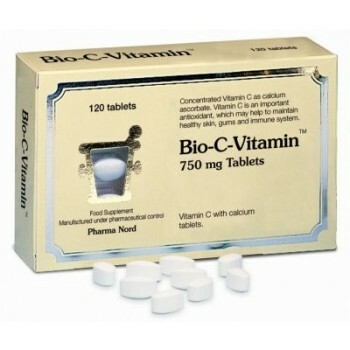 Each tablet of Bio-C-Vitamin contains 750mg of vitamin C, equivalent to that contained in 1.5Kg of oranges. 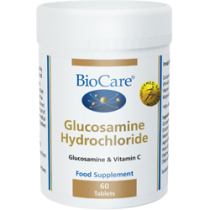 Bio-C-Vitamin is based on calcium ascorbate, a less acidic form of vitamin C which does not disturb the normal pH of the stomach. Pharma-Nord recommends 1 to 2 tablets/day.